One seat is reserved for staff of Manipal Teaching Hospital, Pokhara in Bpharm, or BSc MLT. 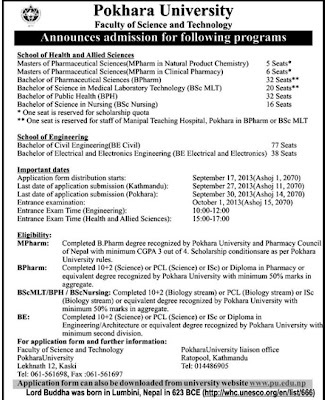 > Eligibility for BPharm: Completed 10+2 Science or PCL Science or ISc OR Diploma in Pharmacy or equivalent degree recognized by Pokhara University with minimum second division (50% aggregate) Eligibility for BScMLT/BPH/BSc Nursing: Completed 10+2 (Biology Stream) or PCL Biology Stream or ISc (Biology stream) or equivalent degree recognized by Pokhara University with minimum second division (50% aggregate). > Eligibility for MPharm: Completed B.Pharm degree recognized by Pokhara University and Pharmacy Council of Nepal with minimum CGPA 3 out of 4. Scholarship conditions are as per Pokhara University rules.